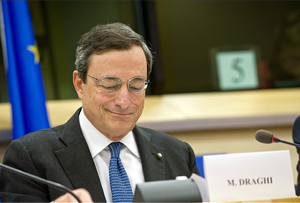 Can new ECB head 'Super' Mario Draghi save the euro? Not the easiest time, admittedly, for incumbent Jean-Claude Trichet to be leaving. But could this trigger an about-turn in European Central Bank policy? It’s European Central Bank chief Jean-Claude Trichet’s last day on the job today: tomorrow, he hands the reins to ‘Super’ Mario Draghi, who will presumably be spending his final day as head of Italy’s central bank anxiously watching what happens to Italian bond yields as banks open after the weekend. Draghi will need to live up to his nickname if he’s to sort out the muddle the ECB has got itself into. Although by all accounts, he’s the right man for the job. Poor Trichet: his time at the ECB will largely be defined by the sovereign debt storm raging over the eurozone for the past few months – despite the fact that the first half of his eight-year tenure was fairly quiet. But he leaves the job during the eurozone’s most turbulent period – which some attribute directly to him, saying the ECB was too slow to respond to the crisis. Rather unfairly, we’d add: after all, as Trichet himself points out, the ECB was the first central bank to pump cash into its financial system, back in 2007. So what will Draghi’s new role consist of? Obviously, everything he does over the next few months will be geared entirely towards establishing peace and harmony in the eurozone. His first few days will be particularly high-pressure: Draghi will be tasked with presiding over his first interest rate decision. Last month, the 23 members of the ECB’s governing council came close to cutting its rates from 1.5%. That could well happen this month, instead. Draghi will also need to decide on the role he wants the ECB to play. Should it simply offer advice/oversee measures brought in by the zone’s respective governments to end the crisis? Or should it be there as the euro’s last resort, offering bailout money when the currency is in crisis? One of Draghi’s most difficult decisions in that respect will be on whether or not the ECB should keep buying up government (particularly Italian) bonds like they’re going out of fashion. Obviously, an Italian standing in Berlin, explaining that the ECB should keep on buying up Italian bonds won’t look great. To be fair, though, he’s warned that the policy can’t carry on indefinitely. And this is, after all, the man who managed to claw back the Italian Central Bank’s credibility, against all the odds. Not only was it part of a government that, with its bunga-bunga antics, became the laughing stock of Europe – but it also had to recover from an alleged insider trading scandal involving Draghi’s predecessor.